It’s grilling season! We love this flavorful, no bbq sauce approach to grilled chicken. I realized when grilling season rolled around this year that we had put our much used/loved Weber grill out to the curb last fall – it just fell apart after over 15 years. So the minute I saw the basic Weber kettle grill on sale, I hopped on over to the store and nabbed one. 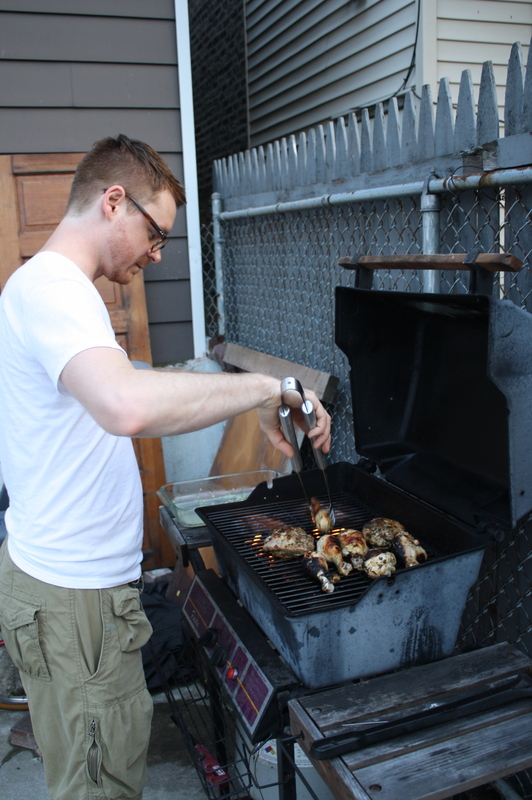 We inaugurated the new grill with this chicken, feeling like we were kicking off the summer of 2011. Margaux says . . . .
We have a gas grill, which comes in handy since we sometimes grill every night. It’s quick and easy. But lately Jason has been really wanting a charcoal grill, and I have to agree that there’s nothing quite like charcoal-grilled food. We may be getting one soon, for weekend grilling though, since it’s a little more time consuming. Ingredients – this is definitely a recipe of approximations! 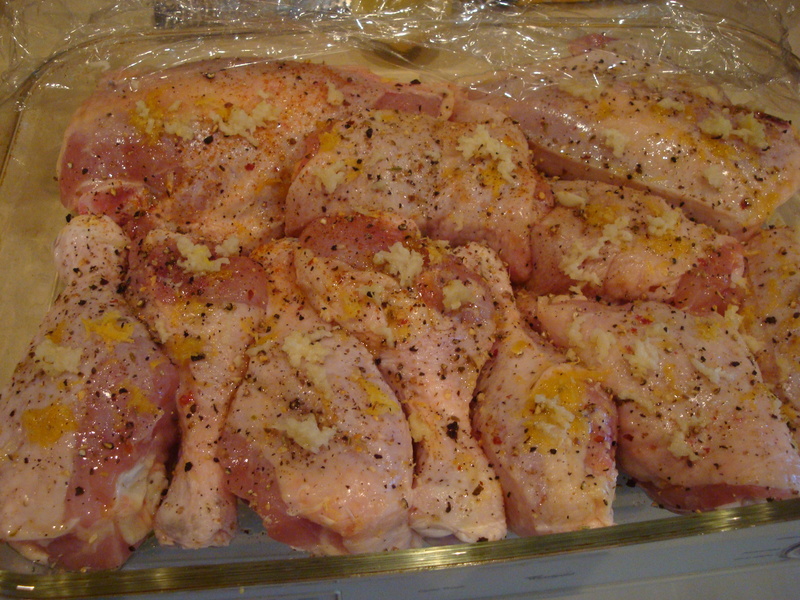 Place chicken pieces in an oblong glass baking dish (or dishes depending on how much chicken you have). Drizzle olive oil and squeeze the lemon juice over all. Turn pieces to coat. Scatter all remaining ingredients over the chicken, cover and place in the fridge for at least an hour or overnight if making the day before you grill. Aunt Suzy says . . . . Light a bunch charcoal using an electric starter or charcoal chimney. We recommend lump hard wood charcoal vs. briquets, but either will work. 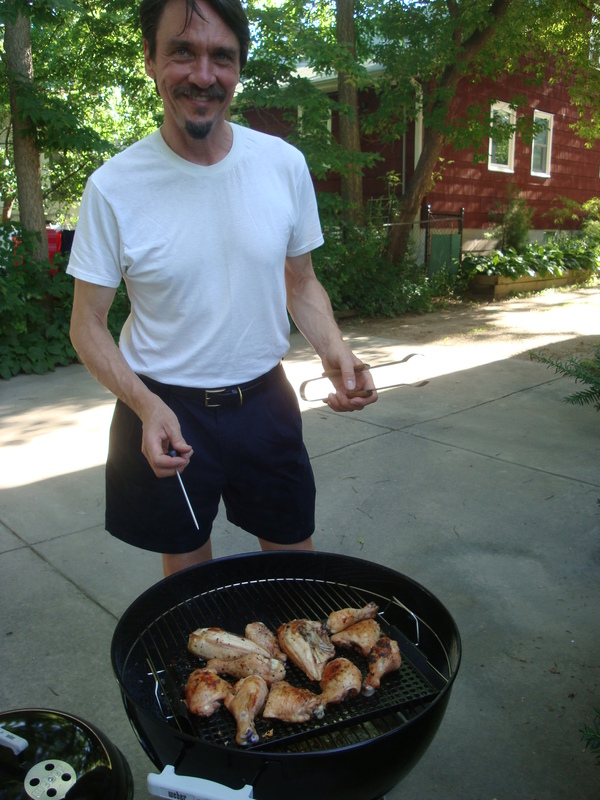 We’ve been using Woodstock Charcoal lately, but we also like Whole Foods version. We DO NOT recommend lighter fluid. 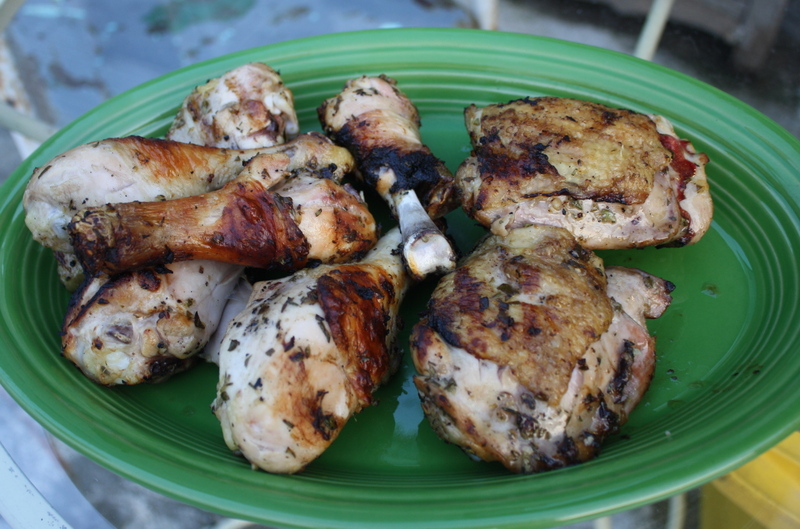 We also like the indirect method of grilling this chicken vs. directly over the coals. Bank the hot charcoal to one side of the grate and place a drip pan on the other side. You can put water and herbs in the drip pan, but this is not necessary. 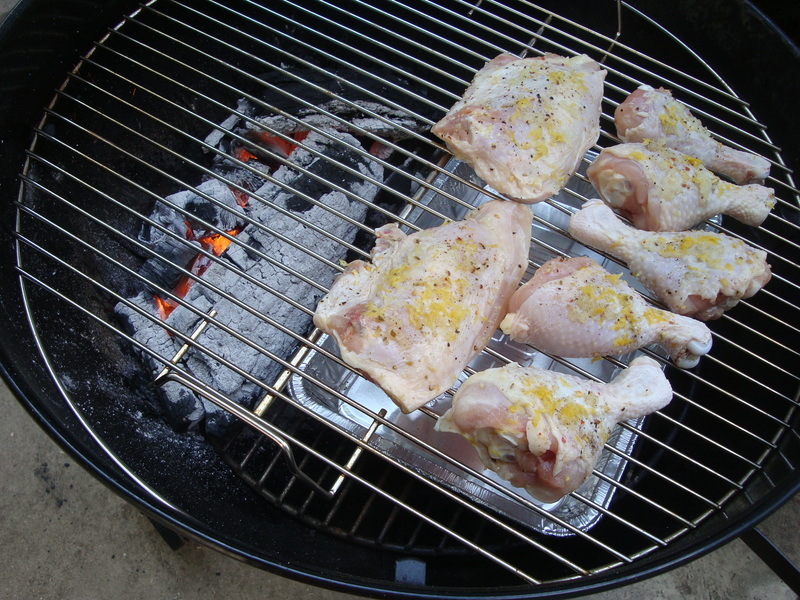 Place the chicken on the side of the grill rack over the drip pan. You can do this right on the grill top – we sometimes use a flat cast iron thingy made for grilling vegetables. Put the lid back on the Weber, with bottom and top vents wide open. Check every 7 or so minutes, turning pieces and moving around so all cook evenly. The total time should take about 25-40 minutes depending on how big the pieces are and how hot the fire is. For the indirect cooking method, you’ll want a pretty hot fire, less so if you cook directly over the charcoal. You can see in the photo, Tatum has an instant read meat thermometer that he uses to make sure the chicken breasts are done but not dried out. Margaux says . . . . Preheat all burners on high, then adjust heat to moderately high. Turn off 1 burner and arrange chicken legs and thighs on lightly oiled rack above it. Cook, covered with lid, turning legs once, until cooked through, about 40 minutes total. (Jason uses an instant read thermometer to make sure they’re done.) Transfer to a serving platter and keep warm, loosely covered with foil, while cooking breasts. Cook chicken breasts on rack above unlit burner, covered with lid, turning once, until just cooked through (the meat next to the “tender”, when opened slightly, will be moist but no longer pink), about 30 minutes total. « Science Project – Iced Tea!